Showcase of arts and culture takes place Sept. 26-27. Flowers and film will be two of the major highlights of Japan Fair 2015, a weekend extravaganza of Japanese food, music and arts to be held Sept. 26-27 at the Japanese American Cultural and Community Center (JACCC) Plaza in Little Tokyo. A floral mural created by Yasuhiko Fujikawa. Renowned artist Yasuhiko Fujisawa will travel from Japan to create three large-scale murals consisting entirely of multicolored flower petals. 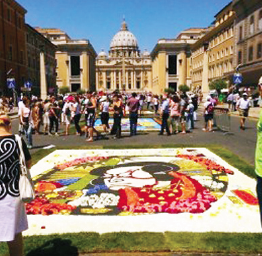 Children and parents attending the fair will be able to participate and assist this master of “infiorata,” a unique technique originating in Italy, as he makes these Japanese-inspired works of art. The fair’s main stage will feature taiko, koto and shamisen performances, kendo demonstrations, and a children’s choir, among other entertainers. There will be various food booths, a beer garden, and a sake-tasting area, where experts will be on hand to explain the finer points of Japanese rice wine. Japan Fair 2015 will take place Saturday, Sept. 26, from 10 a.m. to 8 p.m. and Sunday, Sept. 27, from 10 a.m. to 5 p.m. Tickets are only $3 in advance and $5 on the day of the event. The event is organized jointly by the Japanese Chamber of Commerce Foundation, Orange County Japanese American Association, and JACCC. Funds raised go towards community development initiatives. For more information, visit www.japanfair.org.